Unsure about Iowa used cars for sale? Confirm your suspicions by running the Iowa free license plate lookup. Enter any Iowa VIN to get a free vehicle history report. The Iowa Department of Transportation has records that may guide you with your vehicle shopping. You may call at 515-237-3110 for inquiries about vehicle registration. Visit the Help Center page if you need further assistance. You must register your vehicle at any county treasurer’s office within 30 days of becoming a resident. In addition, your record about current ownership and your Iowa certificate of title/registration are needed to register. Registration fees may vary per county treasurer’s office. If you moved into another county, you must inform your previous county treasurer about your new address within 10 days of establishing residency. This will allow your vehicle registration to be transferred to your new county. The Iowa Department of Transportation is the official license plate provider of Iowa. Each Iowa passenger plate has three letters and three numbers in general. Like most states, Iowa issues two license plates for each vehicle. One plate is placed on the front, while another plate is placed on the rear. Request a duplicate plate for $10 each to replace your lost/stolen one. Applicants inside Iowa may need to provide a proof of identity to request a duplicate plate. If you were outside the state and unable to request for a duplicate plate, you may need a temporary driving permit to drive your vehicle inside the state. A plate transfer should be indicated on the registration receipt upon vehicle sale. You may visit the How to Sell Your Vehicle in Iowa page to learn more about license plate transfer in the state. A vehicle must meet the state’s safety standards before it can be titled. Upon satisfying the requirement, a manufacturer’s label will be displayed on a car, indicating its compliance. Once this is done, you may start your title application at any Iowa county treasurer’s office. Check the map for the available offices in your locality. You may also join the Electronic Lien and Title system to make your title and lien transactions easier. This can also be an effective means of protecting you from title-related frauds that often happen with paper copies. Another way of getting a title is to acquire a bonded title certificate. This can be an option if you cannot provide the titling requirements of the Iowa DOT. As supporting documents, you may bring any papers associated with the car you want to title. A damaged or lost title can be replaced with a new copy upon submitting the request form to an authorized recipient. In the state, the lienholder has a greater claim to the title than the owner. As such, you may need to communicate with the lienholder if you want to get the car’s title. Call at 515-237-3050 or email invbureau@iowadot.us if you want to file a complaint about the titling process you went through, the manner your dealership handled your purchase, false odometer disclosures, and similar offenses. Buying a used car in Iowa? Don’t make a costly mistake. 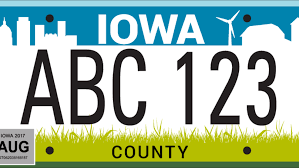 Run a Free License Plate Lookup for your Iowa-registered vehicle! Run a Free Iowa License Plate Lookup to uncover the full-story of your Iowa-registered vehicle.